Portable Washdown Systems (PWS) are designed with premium marine grade components designed to withstand the harsh marine environment. Our systems are simple, efficient and durable as long as the recommended routine maintenance is performed and the system is not modified. There are a few circumstances that may require service. Answers to some of those questions are below. For additional information please call (561) 596 2085 or email CleaRinse. My water pressure has dropped. What can cause this? 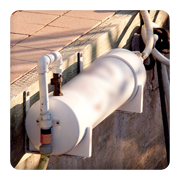 CleaRinse PWS are designed to minimize reductions in water pressure and water flow. The most likely cause is that the pre-filter is clogged and or needs to be replaced. Pre-filters should be replaced every second recharge. If you have considerable sediment or contaminants in your water then replace after every recharge. If your pre-filter is in good condition then check the fitting where you connect the supplied hose (inlet side before pre-filter housing). There is a small screen inside the fitting. I'm seeing white spots after rinsing my boat or RV. There are three possible causes for this issue. The system has recently been recharged (with salt) and the residual brine in the tank is being sprayed onto the finish. The white spots are dissolved salt. Simply flushing the system should resolve the problem. This may also be the result of salt spray being on the finish (coming back from boating or fishing trip) and it not being adequately loosened or removed during the rinsing process. We encourage you to use a soft mitt or brush to loosen the salt so it can be easily rinsed off. Allowing salt to dry onto a finish causes a multitude of problems namely corrosion and the acceleration of finish oxidation. Always try to remove salt from exterior finishes. The system is past due for a recharge. Refer to the CleaRinse care & Maintenance document that came with your unit to properly recharge the system. Can I use a filter from my local hardware store? We recommend the use of our 5 micron pre-filter cartridges. These cartridges have been specifically chosen for use with CleaRinse PWS. Your local hardware store sells inexpensive filters that provide minimal chlorine reduction and sediment removal. You can CleaRinse pre-filters from our site under the Accessories page. I see little beads in my pre-filter housing and in the outgoing water supply. This is the sign of an internal failure. One of the internal distributor cones has become dislodged and is allowing the resin to be washed out. Since our systems are serviceable, this is easily fixed. Contact CleaRinse to discuss the repair. How can I stow my CleaRinse? Does it always have to be upright? When using your CleaRinse it must be in the upright position. When not in use, the unit can lay on its side without problems. It's recommended that the unit be secured to prevent unwanted movement and potential damage to the system and the surrounding area. My GPI Digital Meter doesn't work. As long as there is no evidence of water in the LCD display the unit is probably fine and needs new batteries. You can remove the 4 small screws on the face plate of the meter. Carefully remove the cover and replace the batteries. The unit uses 2 AAA batteries. It also helps to spray some Corrosion Block on the contacts to prevent corrosion. When replacing the cover, make sure the o-ring is in place and doesn't get pinched when tightening the screws. If this doesn't resolve the problem you may need a new meter. GPI warrantees them for 1 year. Contact CleaRinse for warranty and replacement questions. My CleaRinse is several years old and I don't think the resin is working. What do I do? Over time (several years) the resin can become fouled or fail. If the unit has been properly maintained (recharged and pre-filters have been replaced) you can try using our Resin Care liquid with the next recharge. This will remove any contaminants that may have attached or covered the resin. If the Resin care product doesn't work then you may need new resin. Fortunately, CleaRinse systems are serviceable and this is a simple process. You can contact us for resin pricing and resin replacement instructions. My tank is leaking from the top. How can I fix it? Leaks are usually caused by a defected or blown O-ring. The in/out head on top of the softening tank (large tank) has an O-ring which may have blown out. Again since CleaRinse units are serviceable; this is a quick and easy repair. Contact CleaRinse for the replacement part. One cause of O-ring failure is high water pressure. If you have high water pressure (over 65 psi) we recommend the use of a 45 psi to 55 psi (max) pressure regulator before the system. If your leak is from the tank itself (such as a pinhole leak or crack) contact CleaRinse for warranty replacement. Why did the resin in my cartridge change color? We use a high grade mixed bed DI indicator resin in our spot free rinsing systems. The color change is to let you know that it's time to replace the cartridge or resin. My TDS Meter isn't working. This usually is the result of a dead battery or the IN or OUT probes not being pushed into the fitting far enough. Simply replace the batteries in the event the unit doesn't power up. If it powers up but doesn't provide a reading when water is flowing through the system (water has to pass by the probes for it to read a number other than 0) refer to your assembly instructions to remove and reposition the probes. Be careful to not touch the probe tips as oils and contaminants from your fingers can affect the accuracy. It didn't take long for the resin to expire. I thought you said it would purify more water. What gives? We provide you with general estimates for system capacity. Your results will vary as water quality varies considerably from region to region. Using a softening system in front of a DI system doesn't offer much of an advantage as you still have dissolved solids in the form of sodium the resin must remove. The only time we recommend the use of a softening system in front of a DI system is if you have well water or extremely hard water 20+ grains of hardness. Our Spot Free DI systems are recommended only for the rinsing process and not the entire washing process. Do I have to buy a new cartridge when my resin expires? No you can purchase resin in bulk from CleaRinse. This is the same resin we use in our DI systems so you will have the same performance as our new systems. It takes only a few minutes to replace the resin. You can purchase Replacement Resin in the accessories page of our site. I see other sites selling resin for less. What's the difference? CleaRinse uses only superior grade Mixed Bed Color Indicator DI Resin our DI Systems. This is the same premium grade resin used in professional car washes and industrial applications where ultra-pure water is needed. Other sites may sell a lower quality or grade of resin for less money but the performance will suffer. Some sites may not sell new resin but regenerated resin. CleaRinse sells only new, unused resin. If you have a question or concern that was not addressed in our FAQ, please contact us via email or phone and we'll do our best to resolve them.